I’ve been excited about React ever since it came out but haven’t been able to blog about it. So naturally when ReactNative was introduced last year I was super anxious to try it and even more when the Android support was released. For a quick intro, ReactNative lets you write apps for both iOS and Android using the same set of knowledge you only need to learn once. So its a “learn once, write anywhere” approach. This is different from say PhoneGap where its “write once, deploy anywhere”. Wait a minute, isn’t that more productive if you only need to write once and deploy anywhere? Sure if you have a very basic app, with PhoneGap you’re actually running html+css+js in a WebView, technologies which werent intended to build mobile apps so its an elaborate hack to build apps. With ReactNative you write your components in jsx which gets translated into native components so you get the ease of writing components from familiar technologies coming from React with the performance of a native app. Ok so what about Redux? React encourages having each component manage its state and data flow using Flux architecture, which basically just means that your flow of data should only go through one direction so it becomes predictable and in turn easier to debug among other benefits that i can remember. Redux still encourages single data flow but instead of having each component in your component hierarchy manage its own state, its gets passed down to it coming from its parent. And Redux isn’t just for ReactNative, you can use it with React as well for webapps. Think of it as having a root state which is just a json object with fields in it, each field gets passed to components which only need those data and whenever you want to update some data, you send out an action which gets processed by reducer and changes gets applied on that root state which in turn propagates the changes down to components. So you see it goes around in circle and that’s how it achieves the single directional data flow. 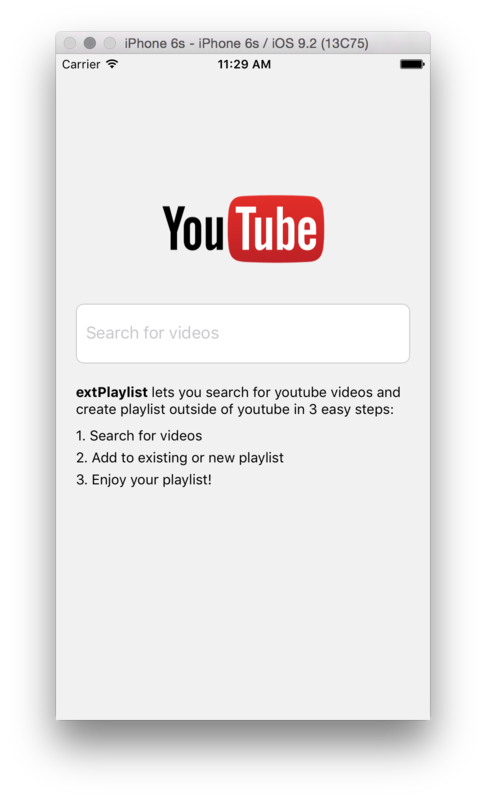 In this post we’ll be writing the basic search functionality of an external Youtube playlist I started called ExtPlaylist. The idea is pretty simple, you just write playlist without having to signup for Youtube account. We do this by storing the playlist data externally using, wait for it… BoltApi :). Although in this post we focus just on search, you can lookup the master branch for ExtPlaylist which already has playing of video and adding them to playlists. Also ExtPlaylist has a search-only branch where you can see a working example of what we’ll be writing. One think to note here, we’re using react-redux@3.1.2 when there’s a more recent version now because the recent version doesn’t work yet with ReactNative with bundled React in it. There’s an ongoing issue about it here but its almost there. Since you could be running in a more recent ReactNative project when you installed react-native-cli, we need to make sure our project’s structure matches the ReactNative version we just installed. On line 12, we’re applying the thunk and logger middlewares. The thunk lets you create async actions for making ajax requests and logger logs the state transition to chrome’s console so you can see the transition from state to state. Then on line 13 we’re creating a store by calling createStoreWithMiddleware against our root reducer. A ReduxStore doesn’t actually know how to mutate your data that’s why it needs your reducers. A root reducer is just a collection of all your reducers which we’ll see later. On line 15-21 we have our wrapper function which returns the Provider component, this is how we get to offer Redux store down to our components. Here we’re just creating the App component with the Search component wrap inside it. Notice how we’re just passing props that are interesting to the Search component and not the whole state. From the App component, we get that search prop from stateToProps declared on line 35. Line 41 creates dispatchToProps function which just wraps everyaction passed to bindActionCreators with dispatch. Line 50 we have some styles, notice that in ReactNative we can use Flexbox to style the layout of our components, how cool is that! Finally on line 78 we call connect which is what connects the props and actions to our App component. 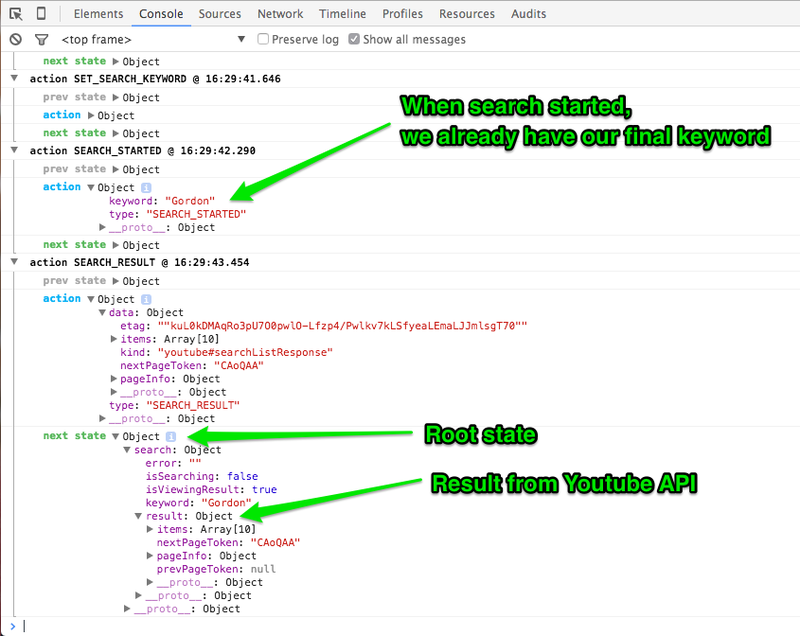 First don’t forget to set your YOUR_YOUTUBE_API_HERE, you can get that from Google Developer Console. The most interesting one is the _searchVideos function, this is the one that actually calls the Youtube API but its private so both paging and initial search can use it. First it dispatches _searchStarted action to indicate that we’re about to run search, once its set this is the perfect spot to turn on preloaders, etc. or anything you want to run once the search starts. Then on line 27, we’re using the new fetch API which isn’t available on all browsers yet but ReactNative has it. fetch is promised based which is much cleaner than callbacks, here notice how for every case we dispatch new actions accordingly and that’s what those extra private actions are for since they are just called internally. I mentioned earlier that thunk middleware allows async actions but only if the action returns a function. With that in mind you can see that both our runSearch and moreVideos does exactly that, while newSearch and setSearchKeyword just returns straight object. This is where the power of Redux shines, with this we can go back and forth the history of our component’s state which would not have been possible have we modified the state directly. If you’re familiar with EventSourcing this is a similar pattern where you aggregate a collection of events (actions) to produce the final state. Remember back in App component where we passed certain props to Search component? You can see them being used here now. Look at handleKeywordChange, that’s the setSearchKeyword action being called. Our Search component is pretty simple, it has Youtube logo, then conditinal display of preloader if search is ongoing otherwise a text field is displayed. On line 42 we also listen for each keypress invoking the handleKeywordChange method everytime so each keys gets set on our root state. On line 56 also notice how we imposed the strict requirement of passing the props, so you can’t use the component without passing all of those required. And if you try entering a keyword and press enter, you should see the preloader displayed while the search is being made and disappear when search is done. At this stage it should feel like nothing happened, but if you turn on chrome debugger by pressing ⌘+D while on the simulator, a sub-menu will appear and select Enable Chrome Debugging. A new tab should open up on your Chrome browser, now go to that tab and press ⌘+⌥+I to open up inspector and click Console tab. You should see a series of SET_SEARCH_KEYWORD actions being logged (one for each keypress) and then at the bottom one SEARCH_STARTED followed by SEARCH_RESULT. On line 17 we create a DataSource and assign it to this.ds, the ListView component needs it to be able to render rows of items. rowHasChanged is pretty basic rows checking for comparison if one of the rows has changed or not. On line 19 we add a dataSource state by cloning the previous ds we just created, passing in whatever result we got from Youtube. And on line 23, everytime we received new props, we make sure the result gets used as the new dataSource. On line 29, we have a renderRow function which gets called everytime one of the DataSource item gets rendered. It gets passed the item for that row which we then use to render TouchableOpacity button so we can potentially handle click for each row but we’re not going to do that here but feel free to extend the code. Line 46, handleMore is the handler for paging the results, each new batch of results gets appended at the bottom everytime you click the Show more button. Finally on line 75 we display the ListView passing in the dataSource and renderRow functions. If you run this and try searching, you should now see the list of results we got from Youtube. If you hit Show more the button displays a preloader and when its done more results gets appended below. You can also click Search on upper left of navigation bar which lets you search using new keywords. And that’s pretty much it, as always you can checkout the final source code here. The nice thing about this is that you can also use Redux and apply what you learned here on your React webapps!